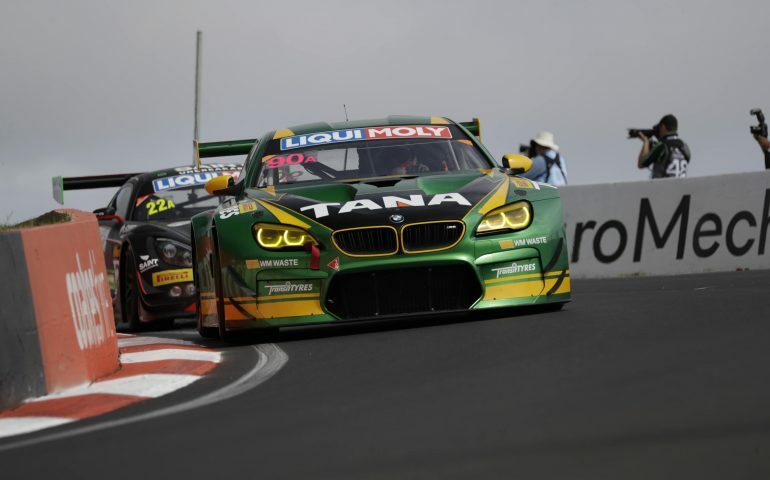 In the first of two qualifying sessions to be held ahead of this afternoon’s Pirelli Top Ten Shootout, Chaz Mostert and the #90 Castrol MARC Cars Australia BMW M6 GT3 has topped the sheets ahead of the #59 Tekno Autosports/McLaren 650s, the #991 Walkenhorst BMW M6GT3 and the #32 JBS Australia Lago Racing Lamborghini. The second qualifying session – hitting the track immediately after Q1 – is for Class A cars only. In the other classes, it was up to the teams to make the most possible of the hour long Q1. Turning in the fastest times for their classes were the #4 Grove Hire Porsche 911 (2m 08.532s – myPlates Class B GT3), #48 M Motorsport KTM X-Bow GT4 (2m 17.713s – Avis Class C) and the #65 Daytona Sportscars Dodge Viper Coupe (2m09.619s – Racer Industries Class I), with plenty of action across all of the class battles. Even with two sessions to be held for Class A, the fight for the outright top spot started with earnest in Q1. The first representative time was set by the #911 Walkinshaw GT3 011 GT3 R (2m 04.471s) seven minutes in, with Marco Wittmann quickly following that in the #60 Laser Plumbing and Electrical BMW Team SRM M6 GT3 with a 2m 03.917s lap. Will Davison didn’t let that stand very long, setting a 2m 03.386s in the #59 Tekno Autosports/McLaren GT 650s just two minutes later, three minutes before the first red flag of Q1 flew for Charles Putman and the #18 PROsport Performance Porsche Cayman PRO 4. The #18 went into the wall at Virgin Australia Corner, and race officials decided during the red flag period to extend the session for the duration of the red flag period, up to the maximum possible (ten minutes) to see the finish time for Q1 amended to 11.50am. Green running would resume seven minutes later. The angst for the #18 wouldn’t end there either, with it and its sister-car the #19 PROsport Performance Porsche Cayman PRO 4 later excluded from taking further part in qualifying for refuelling during qualifying. Chaz Mostert – who topped practice two yesterday – would then take the #90 to the top with a 2m 03.095s before it was time for another red flag. This time the flag flew for the #11 Objective Racing McLaren 650s, which became beached in the run off area of Virgin Australia Corner. With 12 minutes remaining, the #59 found itself off the track after a spin at turn 22. Thankfully, driver Ben Barnicoast was able to point the machine in the right direction to drive it back to pit lane to avoid another red flag. Unfortunately for the team, the regulations state that no repairs are able to be undertaken between Q1 and Q2. Also experiencing issues and lamenting the ‘no repair’ rules was the crew of the #61 Hogs Breath Café Mercedes, with power steering issues plaguing the entry much to driver David Reynolds frustration. With six minutes to go, the third and final red flag of the session flew, this time for the #99 Walkenhorst BMW M6 GT3 with Ricky Collard coming acropper in the Coates Hire Esses just before the Spearsbox Dipper. The session was declared at this point. Following its Audi Mountain Straight incident in the opening stages of practice five, the #62 R Motorsport Aston V8 Vantage did not take any part in qualifying, with damage forcing its withdrawal from the event. While the #62 was unable to take any further part, the other victim of practice five – the #23 Nissan Motorsport GT-R – was able to make its way back to the track in the later stages of Q1 for some laps ahead of Q2.